It&apos;s the morning after for Nina and Valentin. He questions how she feels about him. Nina admits there&apos;s something serious between them despite everyone else&apos;s claims against him. Nina wonders about his shady past, but Valentin feels that&apos;s what brought them together. He wants a real relationship. Nina wants them to slow down. He accepts that. Franco runs into Liz, who still hasn&apos;t gotten over his altercation with Tom. Franco swears he was only trying to protect her. Liz wonders what he will do if he runs into Tom again. Franco swears he has no intention of killing Tom. Liz says she won&apos;t let her fear of Tom stop her from living her life. Maxie and Lulu head to New York to find out information on Charlotte. They visit Claudette&apos;s OB/Gyn. While Maxie pretends to be pregnant to distract the doctor, Lulu searches the file cabinet and finds a file on "baby Cassadine". Lulu finds out that while Valentin is listed as Charlotte&apos;s father, Claudette is only a surrogate. Dante tells Nathan that there is no sign of Claudette and that the Canadian officials are planning on declaring her dead. Nathan figures they should pay Valentin a visit to find out if Lulu could be Charlotte&apos;s biological mother. Finn&apos;s worried about Hayden since he hasn&apos;t seen her in a few days. Tom runs into Kiki. He says she could be a model and wants to photograph her. He gives her his info as Dillon walks up. Kiki tells Dillon about Tom. He recognizes the name. Dillon warns Kiki to stay away from Tom and explains what he did to Emily and Liz. Franco spots Tom talking to Kiki and confronts him. Tom says to leave him alone and that he&apos;s only trying to restart his life. Franco warns Kiki about Tom and says he wants her help in keeping women in the city safe. Liz runs into Hayden at the skating rink and wonders why she&apos;s not at the hospital board meeting because she&apos;s the financial advisor. Liz questions if Hayden is sick. Hayden dismisses her concerns. Liz call Finn. Finn finds Hayden, who says she&apos;s made a bucket list and has accepted that she will die. Hayden passes out on Finn. Nathan and Dante pay Valentin a visit. They tell him that Claudette was found alive to see what kind of reaction he&apos;ll have. Nina walks in. Nathan gets angry that she spent the night with Valentin. Nina says she&apos;s a grown woman who can make her own decisions and has gone into this relationship with her eyes wide open. 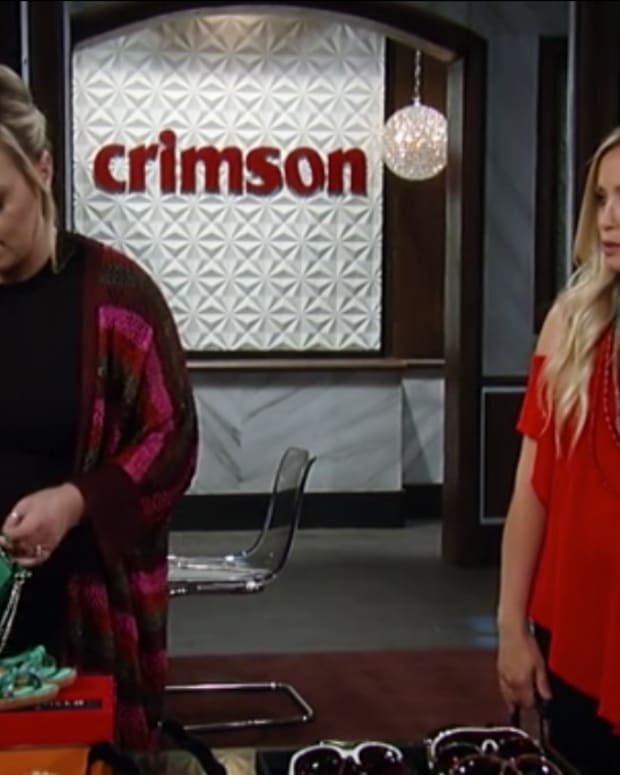 Liz and Monica demand to know what&apos;s wrong with Hayden, so Tracy explains about Finn&apos;s illness. Liz calls someone (Naomi?) and tells them that "their daughter" is sick. Lulu gets caught by the doctor, but spins a sob story so the doctor won&apos;t call the police. The doctor locks Lulu and Maxie in the exam room and calls Valentin for help.